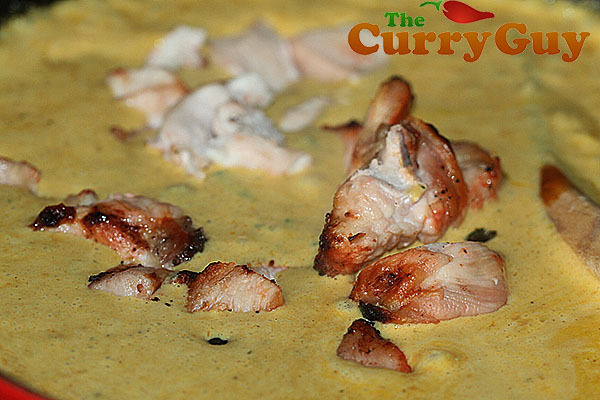 Mild and sweet chicken korma is great for kids and those how don’t like it hot. 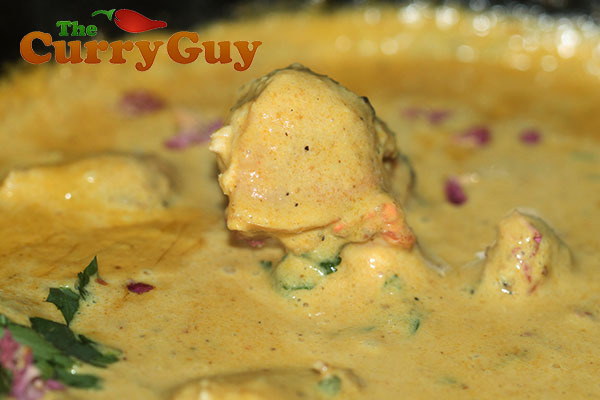 Chicken korma, the most mild of curries is a big favourite of my kids. They order a korma every time we go out for a curry. I think you’ll find this recipe to be pretty similar in flavour to most kormas out there. One restaurant we go to often serves very sweet kormas. I’m not a big fan but if you are, you can easily add a bit more sugar. That’s all it takes. I grilled skinnless chicken breast pieces on the barbecue. The smoky flavour added a lot to this easy dish. You might also like to try my pre-cooked stewed chicken recipe. 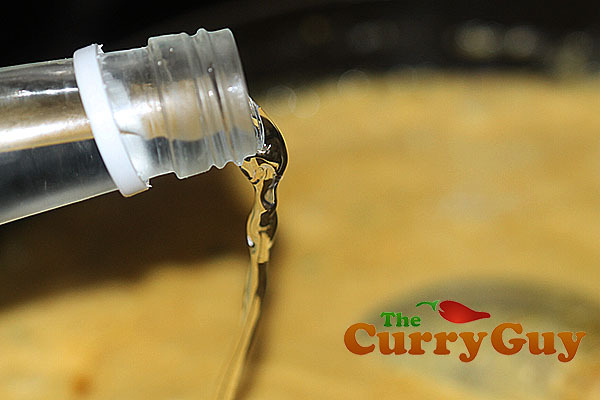 The stock that the meat cooks in can be added in small amounts to the curry to give it a nice flavour boost. 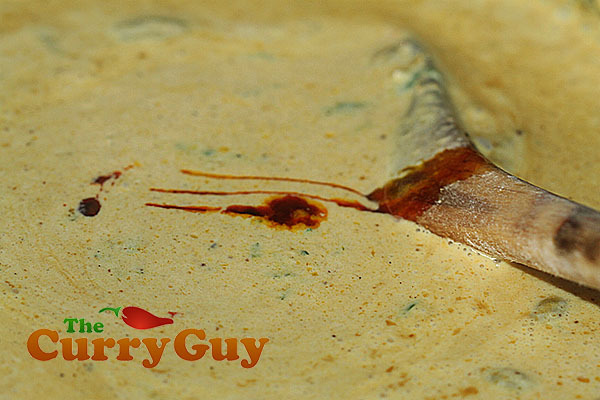 As with all of the authentic Indian restaurant style curries on my site, you will first need to make the base curry sauce. There is a link to the recipe below. Sizzle the spices in the hot ghee. Add the garlic paste and the cashew paste. In goes the coconut milk, coriander and sugar. Squirt in the food colouring. Add the meat. You can add more than suggested if you like. Add a drop of rosewater. Melt the ghee in a frying pan over medium heat. 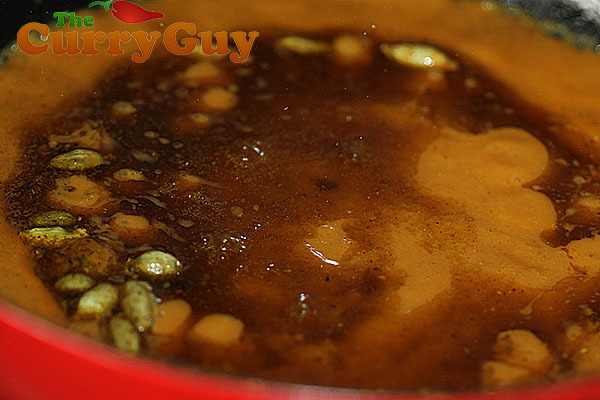 when bubbling hot, stir in the cumin, garam masala and green cardamoms. Fry for about a minute and then add the garlic and ginger paste and cashew paste. 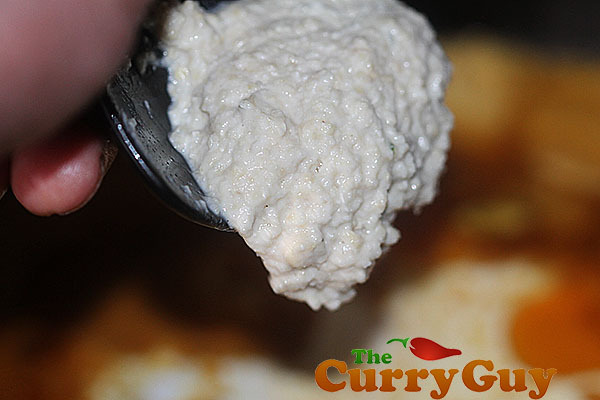 Stir this into the hot ghee and then add the curry sauce, double cream and coconut milk followed by the cooked chicken. Stir to combine and add the food colouring (if using). Bring to a simmer and the add the chopped coriander and rose water. Add the sugar to taste. 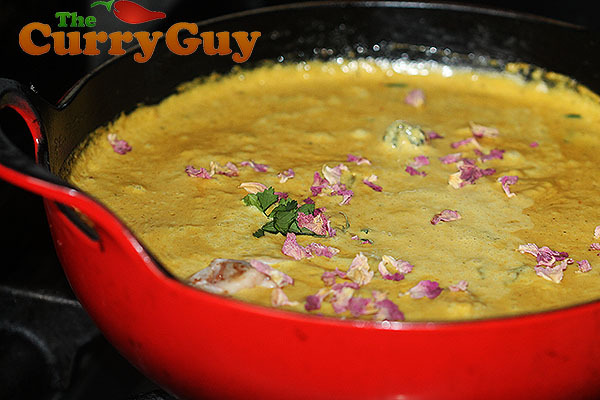 I usually use about 1 teaspoon but you may prefer your chicken korma sweeter. Seasons with salt and pepper to taste and garnish with more chopped coriander and a few chopped dried rose petals. Delightfully light and delicious curry. I love a good korma, and the rose petal decoration is a nice touch. Great to hear. Yes, all of my recipes can be changed. They are just ideas which I hope people will make to their own tastes. Good to hear you do. Hi Dan I have ordered your book. in the korma recipe on this it says cashew paste but in your youtube video you used almond powder? have you changed the recipe? can’t wait to cook. Hi David – Thank you very much for purchasing my book. I have learned and developed so many recipes for korma. They are all quite similar. Either cashew paste or almond powder will do! I hope you like the recipe. Do you use the full cardamom or just the seeds. Just made the masala it was superb. I use the cardamom pods. There is a photo showing this. You could take them out before adding the sauce ingredients if you like. I usually just leave them in. The ingredient list mentions turmeric, but then it doesn’t appear in the cooking instructions. 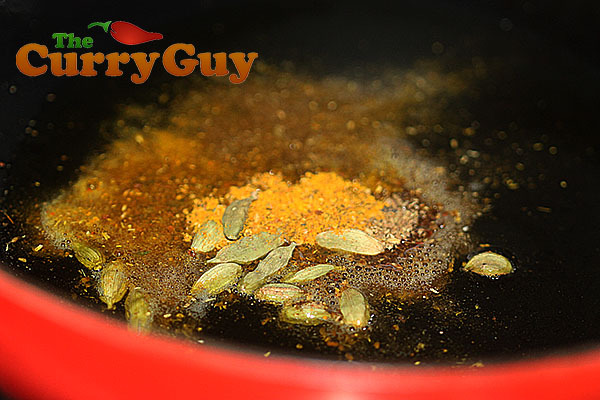 Do you add it with the “cumin, garam masala and green cardamoms”? I noticed this too, Vince. I added it with the spices at the start. Just an error, I think! We fancied a change and this korma dish was lovely, my fiancé also enjoyed it. I have never made a curry base before just made curry pastes instead. 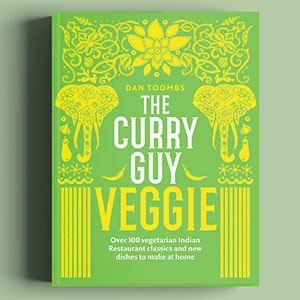 I am making the madras recipe this evening so looking forward to it. Great to hear Hayley. Good luck and enjoy. Missing uk curries after twenty years in remote western australia! How can i adapt this t make vegetable korma for aussie veg friends? Just add the veg after makng sauce ? Steam veg first, like butternt squash etc? Excited t try this. There are two ways you can do it. I usually pre-steam my vegetable until they are just cooked through. Then all I have to do is heat them up in the sauce. Perfect! If you don’t mind cooking the veg while your friends are around, you could just cook them in the sauce. Obviously some veggies will take longer but I’m sure you know that. That recipe looks very nice ! However, I just bought your ebook and something’s puzzling me : why the recipes are so different between your ebook and your blog ??? 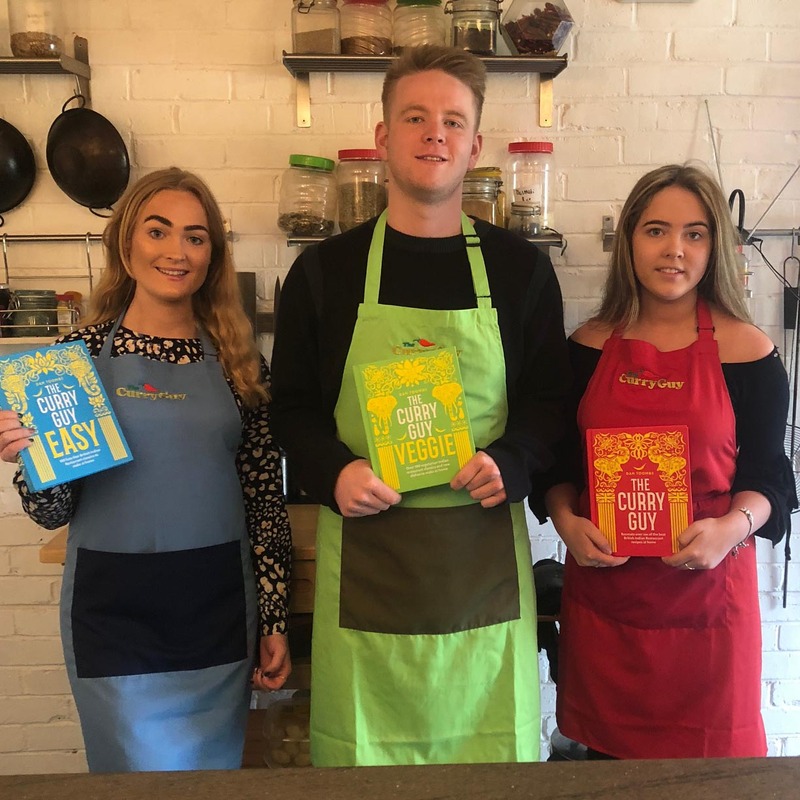 Recipes on the ebook are far more simple, and they are all almost the same whereas the recipes on your blog look tastier and more genuine. For example, in your ebook, you don’t use garlic and ginger paste, you don’t use cardamoms pods but pouder, you begin by heating the curry sauce and then you add the spices (which is an odd way to cook, as in indian recipes, we always to sizzle the spices in hot ghee). 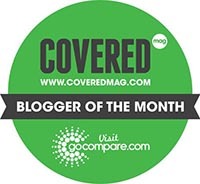 Your blog is awesome but it would be great to update / correct the errors in your ebook. Please. Thank you. The ebooks are in the process of being updated. I wrote the book I think you are referring to in 2011- 2012. I have learned so much in the past four years. I’ve visited many more restaurants and learned tips from excellent chefs. The great thing about ebooks is that they can be updated which I will do. Problem is finding the time. I actually lost the only copy of that ebook I had so I will either be rewriting it completely or trying to deal with the html version I can download from Amazon. The photos on my blog are better because I have invested in a better camera. 🙂 All will be updated soon. I’ll find a way. I promise. You use garlic n ginger paste in most of ypur recipes. Is this something you have made yourself or supermarket stuff? Is it better t use fresh? You can purchase garlic and ginger paste but it is far better to make it yourself. I have a recipe on the site but to make it easy for you, simply blend equal amounts of garlic and ginger with just enough water to form a paste. I keep a stash of this in the fridge all the time now. It’s a bit laborious peeling all the garlic, I must say, but I just do about three large bulbs and equal ginger and a drizzle of water from the tap and then blitz them with a hand blender. Much cheaper than buying those measly little supermarket jars! Are you marinating chicken before you make chicken korma and if you marinate it how much time you will take to marinate the chicken? Did this the other week with my newly made gravy and cooked chicken. Delicious!! I added just a touch of chilli powder, though not so much as to overpower all the other flavours. My husband and I lived in the U.K. For ten years so you can imagine how we miss the local tandoori. After years of searching and trying everything available in Ohio (ha! ), Ive finally found what we’ve been wishing for. I’ve made this three times so far. It’s the closest thing I’ve found to perfect! We’ve also made the madras, which our local Indian does not offer. 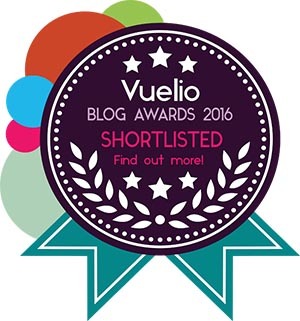 Jalfreizi for my husband, lambrogan josh for my son, can’t thank you enough. Hi Dan. I’ve made this recipe three times in the past fortnight for my heavily pregnant wife as well as your madras recipe with beef for myself and, true to your word, it’s as close to takeaway/restaurant curry as I ever imagined I’d be able to make. 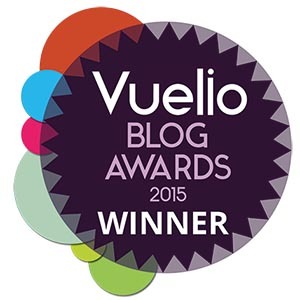 I’m chuffed to bits. 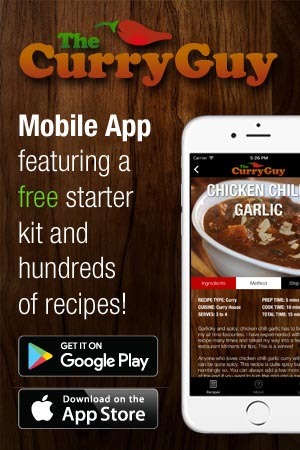 How many recipes are now on this website which incorporate your pre-made base sauce? That stuff is a miracle and unbelievably simple! Thank you very much Paddy! I’m really glad you like the recipes. I have about twenty on the site but I’ll be writing many more. There are some new versions in my cookbook. Once it’s published, I’ll probably put other versions on the site along with some new ones. Received my cookbook today. I am thrilled with it. It is a wonderful book. However I have already noticed two of my favourite recipes on the website and on the app are very different than the new cookbook. The Chicken Korma in the new book does not use Cashews at all. rather it uses ground almonds. I imagine this will alter the flavour quite a bit. Also the lamb Jalfrezi is a different recipe as well with the mango chutney omitted. Thank you very much Glenn. I’m an experienced curry maker. 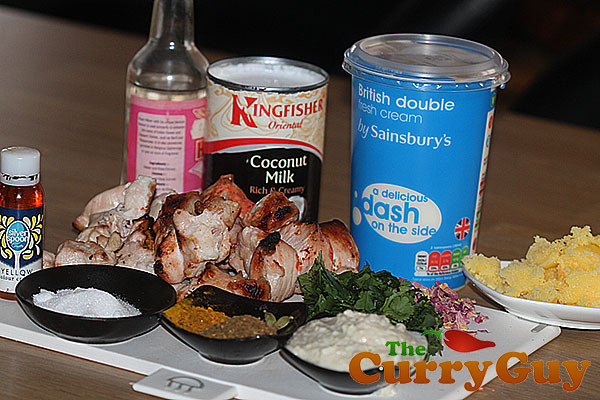 I got your recipe for Korma from last week’s daily mail – and made it last night. I found it fantastic to just cook the chicken and then add it to the sauce: finally, chicken that wasn’t dried and tasteless. However I found the Korma sauce lacked something. I can’t identify what, it teetered on the verge of ‘greatness’ (and my sons agreed). You mention above that you marinate chicken for ‘more authentic kormas’. I am not bothered about marinating the chicken, I found cooking it immediately before putting it into your sauce worked well. 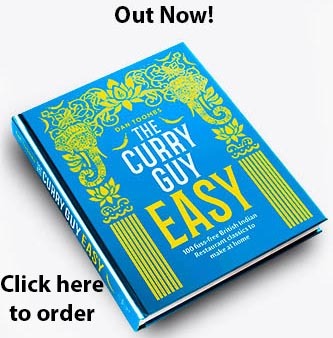 And I like the sauce a lot – is there something in a ‘more authentic’ korma that I could add into this recipe to actually get it to ‘greatness’?? by the way – I am incorporating the ‘base curry sauce’ into all my recipes now, the added depth of flavour is well worth making it. Thanks. Thank you very much for getting in touch. In my book I encourage people to play with the recipes. I’m not sure what it is you’re looking for but feel free to experiment!! If you think it sounds good, it probably will be. Simply awesome site. I have been living in SE Asia for close to 20 years and can honestly say I had never had an as authentic curry in all that time, until now. I have made all the spice blends, the Madras, the Sri Lankan pork and this Korma. All divine! Here in Palawan, Philippines is the nation’s cashew capital so plenty easy enough to pick some nuts and make a fresh batch. I actually used a couple of teaspoons of pineapple and mango jam opposed to sugar. Gave it a real pleasant tropical feed. Thank you very much. 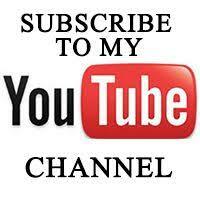 I’m glad you are enjoying my recipes and I love your ideas. Thanks for putting so much time and effort in creating these recipes. The book is awesome and works better with live cooling in a kitchen. I made a few dishes from the book, one by one outstanding. The only thing I change is this. Many thanks for all your recipes!!!! Sounds very similar to what I do in my tandoor. Love it. Thanks for the tip for the oven too. Honest question; why do you precook the meat? It seems to me that the meat would be more savory cooked in the sauce. Pre cooked meat is used at restaurants for speed. You could of course cook it in the sauce as I often do. When using Green Cardamoms do they go in whole or do you have to split them open first and grind them ? Also will they have to be removed at end of cooking ? Thank you very much! I’m really happy you are enjoying the book. If I turn the base sauce into a korma or madras can I freeze to later defrost and add the meat? It isn’t the coconut milk that is the problem. That will freeze fine. 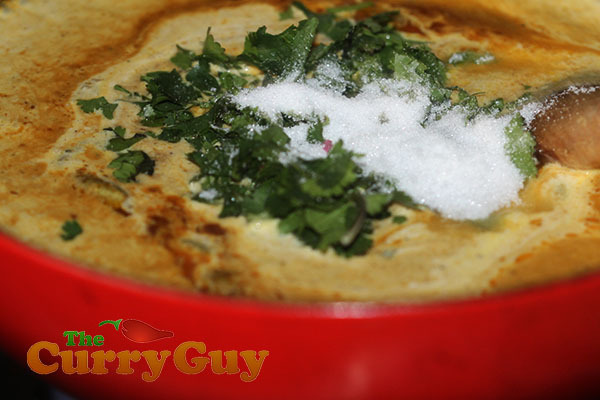 Just don’t freeze the curry if you have already added the cream. 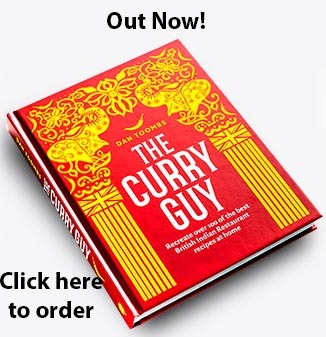 i just bought your book and im browsing to to find the first curry to cook im thinking korma it looks straight forward and my wife keeps moaning i make curries that our wee girl cant eat. Dairy really doesn’t freeze well. It will still be ok, but I recommend freezing it without. Then add it when you are serve the curry. You sure can. 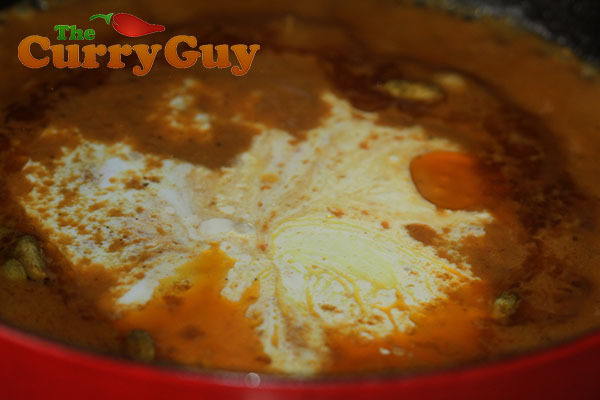 Kormas don’t usually have chilli in them but when I make this at home, I add a lot of them! Qorma is one of my favorite styles of curry. It always tastes so rich and royal. I love that you add the rose water and petals. It adds an extra special touch. Actually, I added about a tablespoon of the rose water. I don’t understand why here in the United States people don’t use floral flavors that much. I love them. Very lovely recipe. Thank you very much. I’m really happy you liked the recipe. It shouldn’t be too hot as there isn’t any chilli powder in it. Perhaps the paprika you are using is spice. Paprika is a spice that can be added at the beginning or the end of cooking. So leave it out at first. Then add it to taste at the end. It’s difficult to cool a dish down once too spicy. You could add more cream but it’s best to just add a little paprika at a time until you are happy with the spiciness.